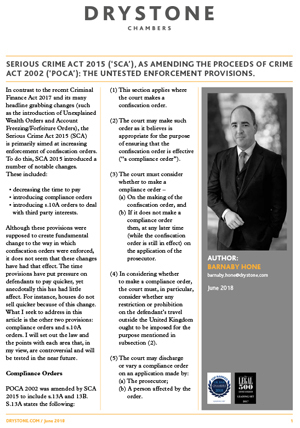 In the following article Barnaby Hone dissects the Serious Crime Act 2015, which was primarily aimed at increasing enforcement of confiscation orders. The act introduced a number of changes including decreasing the time to pay, compliance orders and introducing s.10A orders to deal with third party interests. Is this act being utilised or forgotten? Barnaby discusses how and why the changes introduced by this act should be utilised.